The sales of electric lunch box had started long time ago, with so many different brand in the market that one is really spoilt for choice in deciding which one to get. It took me many months of asking around, reading reviews, checking out prices and of course, waiting for the sales period (Like time-sales or daily sales on Gmarket) that I finally makeup my mind to get these two items that you’ve seen here. Was so happy when I chanced upon it selling at special time sales price of S$36.90. Not only that, the second machine that you saw in the picture, the Yoei ice-cream maker, comes totally agree with my postage. Paid S$40.98, inclusive of shipping for the two machines, which works out to be about $20.50 each. This is so cheap when compare to the original price of S$39.90 at NTUC just for the lunch box only. Was kinda worried when one of my friend who bought an electric lunch box of another brand commented that hers spoilt after using for a mere few months. Been a super cheapo person, I don’t think I bear to spend so much money on something with such a short liffespan. Although there were many positive review about this brand, buying it was like a gamble to me too. I am never ever good at electrical appliances and I tend to damage or spoil them easily. But so far, there don’t seems to be any problem for me. The electric lunch box works in the way that it steamed or heat up the food via the steaming method, so be prepare to wait a slightly longer cooking period as compare to the conventional microwave oven. Here is my virgin trial of cooking rice using the electric lunch box. Included in the box is a small measuring cup for you to gouge how much water to add into the lunch box, be it for steaming or cooking. 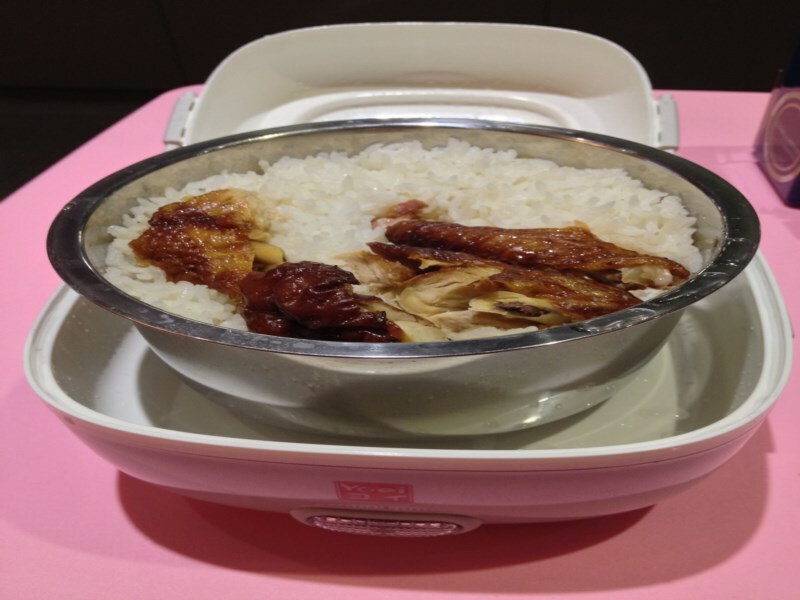 There was also a seperate small dish which can be stack on top of this large bowl for dishes but I prefer to cook mine this way, so that the rice can absorb the flavour of the chicken part I added in. My verdict: Cooking was a easy as a breeze and not as difficult as I imagine it to be. I was half expecting the rice to be partially soggy, especially at the base of the bowl but it turns out just the same as via rice cooker. Food is fairly warm when done. I don’t have to put up with cold tapao food anymore. This is such a lovely babe. Hooray! I’ve finally found myself a new job. After idling at home for more than a month, I sincerely hoped that I have not gotten lazy yet. And on celebration, I’ve decided to get myself something from Gmarket. And after waiting for some time, it finally arrived in my doorstep today. I bought myself 4 bottles of Etude House Missing You hand cream 30ml at a super low promotion price of S$3.90 each. That is quite a cheap deal as compare to the price at our local Etude House stores. Will be giving a set to my beloved cousin when I see her. Despite me buying only 4 items and at such a low price, the seller was very generous in giving free samples. Was only expecting to see a few sachets. The seller truly wow me with all these goodies. I can’t help but feel super pampered. Okay! Okay! I know what you are going to say. Another purchase from Gmarket? Yeah! Why not? Since the things are so cheap. And I only buy things that are super cheap. And as always, the story begins with me browsing through the daily deals available on Gmarket. Then violas, a super deal deal caught my eyes. Pay S$2.50 to redeem for a small beverage at The Coffee Bean And Tea Leaf worth S$6. WOW! That was like almost 60% discount. So tempting! How can I bear to give it a miss? All I have to do next is just to print out the e-ticket from my Gmarket account and present it to the vendor. My choice of beverage- Mocha Ice Blended, from their branch at Vivo city. Sweet and easy! It been such a long time since I made my last purchase. I would often get a cup for my mum after every single one of our shopping treat, At first, my mum only drinks hot coffee. But got kinda hook to it since her first try. Mocha is her favourite choice of coffee, cos she adores the slight sweet chocolate taste. I loved to see the expression she had on her face whenever she drinks the coffee. Its like I had treat her to the world best beverage. I want to continue to pamper her, just the way she pampered me. She is my love, my darling, my most precious mum. But now, I had no chance already. Another Order From Gmarket Arrived! Hooray to the arrival of yet another of my Gmarket order today. Am so happy to receive parcels and letter. Especially when they comes loaded with goodies for me. My latest purchase: Magic scarf. I first got to know about it when I was shopping for some plush toy for a friend’s birthday at Action City. They had a prominent display for the scarf and a promoter was there to show customers the different ways of wearing it. And the price? S$39.90 I was like WOW! Then Giant Hypermart also come out with yet another version of the same product. But this time is cheaper. Is really cheap. But stingy me still refuse to pay such an amount for it. So when I come across this one on sale. I just had to grab them before the price went back to normal again. Bought one for my younger sister and another for myself. I choose light pink and black. But not sure why the pink color turns out to be so different. Seems to be more like purple than pink. Been wanting to try my hands on this mask long time ago. But being a super stingy person as I am, the price is not wallet friendly to me. So when I come across a Gmarket promotion where they are going at S$0.19 per sheet, I know its time for me to get them. Took about a week for it to be delivered from Korea to Singapore. And was so happy to see it in my mailbox today. Am so gonna give my skin a pampering treat tonight. The Foodaholic 3D natural Pulp mask sheet, as it name suggest, is a three dimensional facial mask that is specially designed to fit the face contour, especially the nose bridge area. That is not all, the mask sheet is made with all nan’t that brilliant of them to invent such lovely mask? Can’t wait to try them out soon.